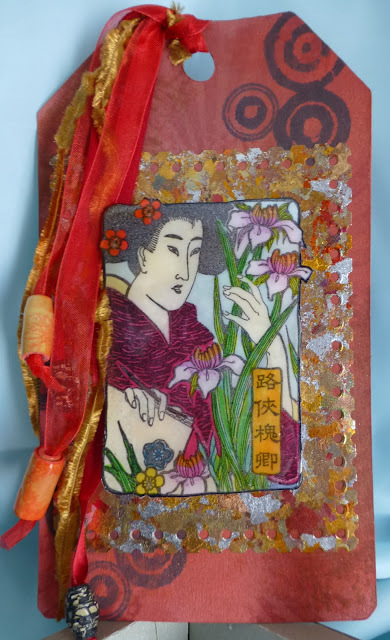 i found an old tag that i had made before but just placed it into the 'LATER' Box.Over the past few weeks i have been so impressed with the latest stamp sets from LYNNE PERRELLA under the umbrella of PAPERARTSY. This time i went back to a stamp set Ref: LPC021. These stamp set are so 'Fresh' and are interesting and can be used for almost any occasion that you would like to use them for. Along with a set of stamps that can add interesting background layers from TIM HOLTZ. Under the name of STAMPERS ANONYMOUS Ref: BITTY GRUNGE CMS089. i could also get to play with my Melting Pot! These stamp sets and a large collection of other creative Stamp Makers from THATS CRAFTY ON LINE STORE. A visit highly recommended! This is the first time that i have used this form of embellishment. i know its not new but its something that i felt would give me an Oriental feel. By sticking the flakes onto one side of the double sided sheet and then removing the excess your left with a metal sheet which can then be cut into any shape you want with the aid of a metal die/punch or just a pr of scissors. The finished sheet. Ready to be used in any project you want to use it in. The 'metal' sheet after it had been put through a die cutting machine and a metal die. Both the inside as well as the 'Offcut' can be used so by careful placement and cutting your able to get a mat and a frame from a single sheet. Using the Black ink the stamp was stamped onto the white card stock. As l was using Alcohol pens then this ink is perfect to use as the stamping medium. The colouring mediums was a mix of Pro-Markers as well as Flexi-Markers. As they are different colours they can be combined to create the image you're looking for. Here is a side bar of the colours that i used to colour in this image. its something i like to do so that if i ever need to re-make this project i will have a record. Also if a fellow crafter wants to make a copy of this image. Then for one of my favorite colouring mediums when it comes to small projects. Glitter Gel Pens. They are perfect for adding just that hint of sparkle to a project. As i was going to colour the tag, you have to provide your mediums a key so that it helps with the blending and movement of what your going to use. Using a selection of Pan-Pastels i coloured the tag so that it looked 'Rusted' as well as having layers of colours that were not just in blocks. i have just found this fixative. i have in the past used el-cheapo hairspray, however the true colours did not always come out and it looked dull. This is a wet spray that doesn't have anything harmful in its composition, to you or the project you're working on. To give more layers on the tag this set of stamps were used. As the tag is a small space to work with this set of stamps is a small down version from other stamps that have been made by the same company so you're able to mix and match. This project also gave me the opportunity to use the Melt Pot. After i had trimmed the coloured image out i was looking to work towards that Deep Lacquered finish that is common in a lot of Oriental work. That deep glaze that gives the object a high gloss base. Also like i said i get to play with my new toy The Melting Pot. Its something that i looking forward to exploring over the common months. After the Embossing Powder had melted i dipped the topper 3 times into the melted powder. Allowing the 'melted powder' to set and seal in the colours. i did notice that the glitter that i had used as an embellishment really came to the fore and it was brought to life. This was something that i was not expecting, but it just made the image 'Pop' with colour. To finish off the project i found some ribbon that fitted in wit the colour scheme, then with a few home made paper beads that had also been embossed however this time i had used Ultra Fine Embossing Powder. There you have it a tag thats just that little bit different and that can be used as is or mounted onto a blank card base. i'm looking forward to exploring what my Melt Pot is going to do as well as just checking if the Glitter pen was a one off or if its something that can be explored further. Oh Alan, I wish we could have a play day. I skim a lot of blogs but I have to READ yours (sometimes twice) and always learn something new. Thanks for sharing the spray, I didn't know it existed. I like that it doesn't have any harmful in it and it's odorless, that will be nice for the grandkids. I forgot about the lacquer and the oriental. did you burnish the gold flakes? Love the pastels and ink background. Have fun with your melting pot! Vicky Briggs And your tag is terrific! I forgot to ask, can I share your blog on our fb page? Here is the link for you to check out before you answer. Thanks for dropping by, After i had placed the metal flakes onto the sticky surface i did use the Scoochy Foam that comes with the 'Start-up' kit that l bought. if possible i would advise anyone who would like to do something like this to get hold of the start-up kit. The 'scrubber' will last you a very very long time if you treat it with care. i have put a link here so that anyone interested in seeing what i am talking about. Scroll down the page and you will find the kit. i have accepted Vickys kind offer re the FaceBook Page. i hope you all will support Vicky and pay a visit to the page. Thanks again Vicky for the kind offer. 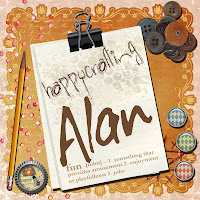 lovely Alan and great tutorial. Love your tag...it's wonderful!!! Thanks for explaining how to make it! Vicky from Crackerbox Palace posted your blog and I'm so glad she did! Your site is great! Thank you Trena and Karen for those kind words and for stopping by and reading my blog. I hope you will visit again soon.